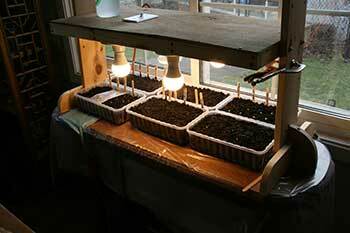 I'm about to start my garden seeds and decided to try supplementing the sunny window with a stand of LED lights. It's a south window but only gets a few hours of sunshine on a good day. It's also really cloudy this time of year. Later I will be able to put the plants in the greenhouse that covers the swimming pool. It's not a heated enclosure so it's too cold for plants right now. The legs are connected to the light frame with 2 nuts and bolts on each side. I'm using regular nuts but I will get some butterfly nuts that are easy to hand tighten. It can be taken apart and can be stored flat. Because regular LED lights do not supply the whole spectrum that plants need, LED grow lights have been developed that are more complete. I am not worried about this because this light stand is intended to supplement the outside light and will only be used for a few weeks. I made the legs with only the crosspiece at first and found that I wanted a slightly more stable base so I added the side support. 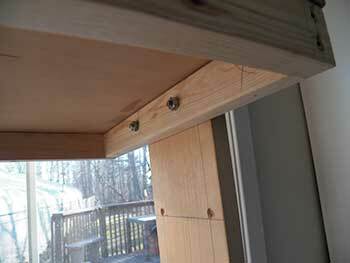 I marked the holes for the bolts that support the light frame on one leg and drilled both together so they are even. 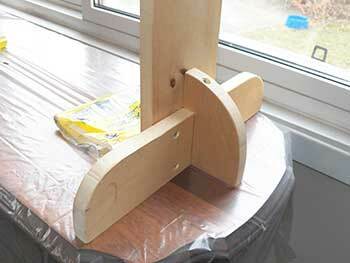 The holes are larger than needed to make it easier to line up the holes of the frame and legs and push the bolt through. NOTE: This set up worked very well and allowed me to also have a layer of plants on the top. It was easy to move the shelf up and down. 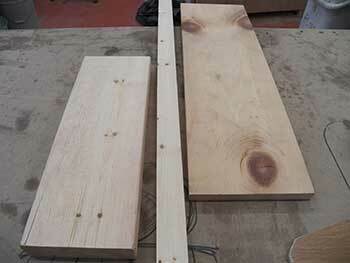 The legs are made from quite rough pine boards I had left over and which were too rough for much, and the light frame from 1x2 lumber cut a 2x4 for another project. Everything is put together with screws. The size was chosen to fit on a side table I have and is made to fit the mushroom boxes I'd planned to use to start the seeds. The table fits 6 of the plastic mushroom containers and there is enough space for a row of smaller pots along the edge. The lights are are wired in parallel so that if one is bad the rest still goes on. I'm using household LED's. I know they are not powerful enough to grow lights on their own. I expect them to supplement the outside light. I wired a switch box to turn on and off. I should have used metal boxes for each of the lights and if I was doing it again I would use them. 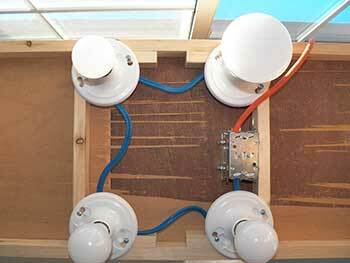 If you decide to do this, use wiring that is of appropriate weight and proper boxes and connectors. Each of the lights draw less than 9 watts each so it's not a heavy circuit. I only put 4 bulbs but I can add 4 more in the outside corners if it's not bright enough. 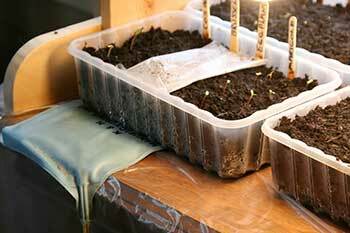 I only use the heating pads till the seedlings have appeared. It helps speed up germination. It's quite surprising. I had several basil seeds germinating in 3 days. The LED light stand worked really well. The seedling germinated well with the extra heat and grew without getting very spindly and tall. The amount of light is not enough to be the only source of light. I would have to put in proper grow lights. I've ordered some, just to see. I plan to grow microgreens this winter. Some plants did better than others. Not surprisingly the plants that can grow in partial shade did better than the ones that need full sunlight. I did not have a timer on the unit but turned it on when I got up (when I went out to feed the birds) and turned it off when I went to bed. This means about 8 hours dark. According to wikipedia: "Grow lights usage is dependent on the plant's phase of growth. Generally speaking, during the seedling/clone phase, plants should receive 16+ hours on, 8- hours off. The vegetative phase typically requires 18 hours on, and 6 hours off. During the final, flower stage of growth, keeping grow lights on for 12 hours on and 12 hours off is recommended"
This information is for general knowledge. I am not an expert electrician. 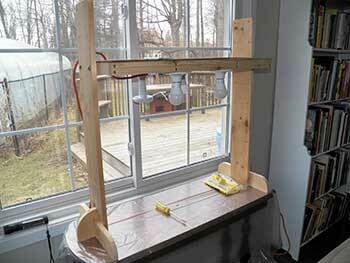 If you decide to make a similar light stand, get help for the electrical parts, or use ready made light units. Microgreens are the next superfood(!!) Besides being good for you I think they would provide green stuff that is hard to come by in a small town and add to the variety of salad/sandwich greens. It might even be cheaper to grow than to buy. Wikipedia article on grow lights.